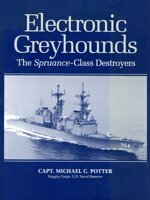 Electronic Greyhounds by Capt. Michael C. Potter. In 1973, Iran first contemplated an order for two “cruisers,” a number it increased in 1974 to six ships to be named for Persian emperors Kouroosh (Cyrus the Great), Daryush (Darius the Great), Ardeshir, Nader, Shapour and Anoushirvan. To these, in anticipation that it would supervise their construction, the US Navy tentatively assigned hull numbers DD 993–998. In 1976, however, after Congress declined to interrupt construction of the original 30 Spruances, Iran reduced the order to Kouroosh, Daryush, Nader and Anoushirvan. Between June 1978 and May 1979, Litton Industries laid keels for these four ships at its Pascagoula, Mississippi shipyard. On 1 April 1979, meanwhile, the Iranian people voted in national referendum to replace the Pahlavi dynasty with an Islamic Republic under Ayatollah Ruhollah Khomeini. The new government soon canceled its order, placing the ships’ future in doubt. After a vigorous debate in Congress, however, they were completed and delivered to the US Navy in 1981–82 as Kidd, Callaghan, Scott and Chandler (DDGs 993–996), all named for admirals lost during the Pacific war. Length: 563' 4" overall; 529' waterline. Draft: 23' hull; 33' navigation. Displacement: 9,950 long tons full load. Complement: 28 officers; 320 enlisted. Propulsion machinery: 4 x LM 2500 General Electric gas turbines, 80,000 shp; 2 shafts. Range: 6,000 nm @ 20 knots. From the beginning, the Kidds’ designers contemplated operations in the Persian Gulf where heat, dust and sand were factors. Accordingly, they received four air conditioning plants rather than the Spruances’ three, additional dust separators on their gas turbines’ air intakes and increased water distillation capacity. To the Spruances’ anti-submarine capabilities, they added two Tartar-D missile launchers—modifications that increased displacement by 700 tons but also earned them contemporary acclaim as the US Navy’s best destroyers ever. In 1988–90, the Kidds’ air defenses were enhanced with a “New Threat Upgrade.” This included a new superstructure and heavier mainmast that somewhat detracted from their appearance but enabled cooperative engagement with Aegis cruisers and the soon-to-arrive Arleigh Burke-class Aegis destroyers, which could control the Kidds’ surface-to-air missiles while they remained electronically silent. As in the case of the Spruances, however, delivery of the more cost-effective Arleigh Burkes shortened the Kidds’ US Navy careers. They were decommissioned in 1997–99, when it appeared Greece might acquire them to replace its four ex-Charles F. Adams-class destroyers until it declined in November 1999. Following Congressional authorization in 2001, however, the four Kidds were reactivated, upgraded and recommissioned in 2005–06 as the Republic of China (Taiwan) Navy’s Kee Lung class: Kee Lung (ex-Scott), Su Ao (ex-Callaghan), Tso Ying (ex-Kidd) and Ma Kong (ex-Chandler). They remain in commission today. Sources: Friedman, Military Analysis Network, Potter, Destroyer History Foundation database.